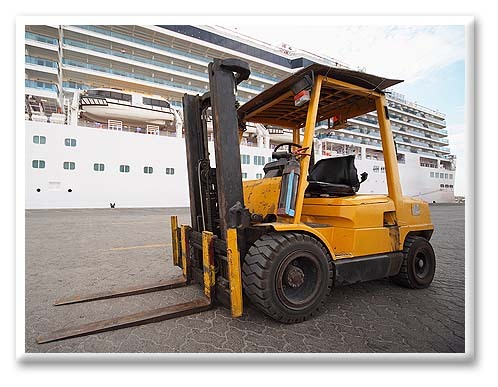 Along with their cushion tire counterparts, Internal Combustion or IC pneumatic lift trucks are the kinds of vehicles you think of when the word "forklift" is mentioned. Pneumatic tire forklifts are often more versatile than their cushion tire cousins and can be operated indoors or out and don't require as smooth a surface to ride on. They are often seen in indoor-outdoor settings. At Reconditioned Forklifts, we always have a full complement of Class 5 diesel forklifts for sale. An IC pneumatic lift truck is often chosen because it can be used outdoors, where diesel fuel can safely be used. If you are going to be using your forklift in a well ventilated indoor setting, another type of fuel may be preferable. If in doubt, ask our used forklift customer representative for his advice. Where there is the risk of pneumatic tire punctures, solid rubber tires (also classified as pneumatic) are often used. These are interchangeable with standard air filled pneumatic tires, so it is unnecessary to limit your choice of used IC pneumatic lift trucks simply because of the type of tire you prefer. Again, our highly skilled customer representatives can help you with all the details about your purchase of reconditioned IC pneumatic lift trucks. Just contact us with any questions you may have about any of our range of used forklifts.